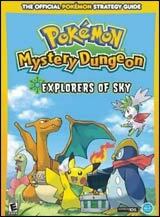 Pokemon Mystery Dungeon: Explorers of Sky is the newest installment in the Pokemon Mystery Dungeon video game series. The game expands on the fun found in Pokemon Mystery Dungeon: Explorers of Time and Pokemon Mystery Dungeon: Explorers of Darkness. Players become a Pokemon and team up with a partner Pokemon. Together the two set out on an adventure of exploration and discovery, ultimately saving the world from destruction. With additional Pokemon to become, new "Special Episodes" and enhanced communication features, this is a grand adventure with a moving story and stunning finale. 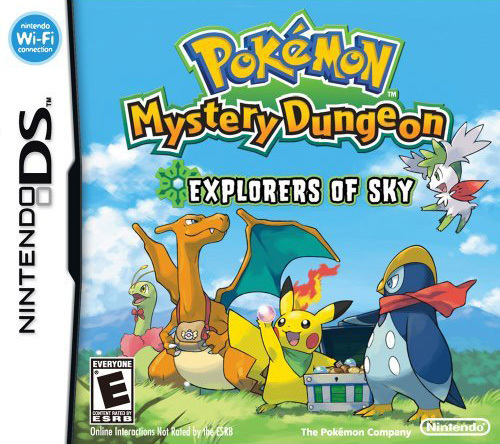 This game is a great starting point for players to enter the world of Pokemon Mystery Dungeon and for returning players to discover even more secrets. 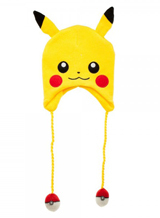 Play as one of 19 different Pokemon (including five additional starter Pokemon). Find out which one you will become. Interact with more than 490 Pokemon as you explore. Trade items with your friends via a local wireless connection. Trade with Pokemon Mystery Dungeon: Explorers of Time and Pokemon Mystery Dungeon: Explorers of Darkness and see what happens. Send a demo dungeon to your friend’s Nintendo DS or Nintendo DSi system via a local wireless connection. With a wireless broadband Internet connection, access special Missions or rescue fallen friends over Nintendo Wi-Fi Connection.